This morning fast growing sports apparel giant, Under Armour, released its 2011 numbers. Under Armour Inc.'s fourth-quarter profit rose 42% with full year net revenue coming in at $1.47 billion, 39% higher than 2010. The company said it spent 11.4% on marketing expenses during the year. Despite being a slightly smaller percentage of overall revenues as compared to 2010, marketing expenses were $40 million higher due to the increase of 39% in net revenue on the year. 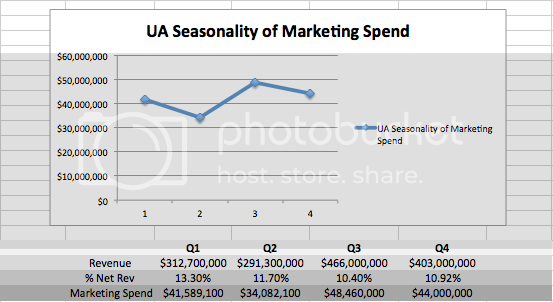 Under Armour said that marketing spend as a percentage of revenue will be on par with 2011 in 2012 with a similarly tracking pattern to 2011's quarterly marketing spend (see below). For 2011, marketing spend in absolute terms was highest in the third quarter of the year, but lowest as a percentage of the company's net revenue.